On the second episode of the Hawks Eye View Podcast, Andrew Snyder and Justin Hodges discuss Thabo Sefolosha‘s injury, Tiago Splitter‘s long list of injuries, Atlanta’s inconsistencies, and more. Welcome to the second episode of the Hawks Eye View Podcast, a weekly podcast here at Soaring Down South. This podcast is, of course, yet another place for us to discuss any and all Atlanta Hawks related subjects. For this episode, site expert Andrew Snyder (that’s me!) is joined by contributor Justin Hodges. The discussion starts with Atlanta’s recent loss to the Sacramento Kings. The Hawks blew a 22-point lead and lost at the final buzzer. This has been a trend for the Hawks this season, losing to teams that are beneath them. In their search for an identity they lack consistency. One of the reasons for this lack of consistency lately has been their inconsistent defense. Their poor defensive play has coincided with Thabo Sefolosha’s groin injury. Sefolosha has missed Atlanta’s last seven games due to this injury. He is currently listed as doubtful for Monday night’s game against the Portland Trail Blazers. The conversation then shifted to Tiago Splitter. Splitter has dealt with several injury issues during his short time with the Hawks. He is currently nursing a calf injury and there is no timetable for his return. He’s played just 36 games as a Hawk. Have we seen the last of Splitter in a Hawks uniform? It’s certainty possible. Another talking point that came up is next Sunday’s All-Star Game. Paul Millsap will represent the Hawks in the game for the fourth straight season. Millsap’s box scores from previous games have been rather modest. Will that change this season? I would expect Millsap to do what he usually does in All-Star Games; play for just under 15 minutes, make a few shots, grab a few rebounds, and then get out. The All-Star Game isn’t suited for versatile players like Millsap. These games typically turn into glorified pickup games with no room for defense. Millsap’s special blend of skill and effort are more suited to games that matter. Still, it’s nice to see him rewarded for his play this season. That wraps up our Hawks discussion for this week. Next week we’ll preview the Feb. 23 trade deadline. 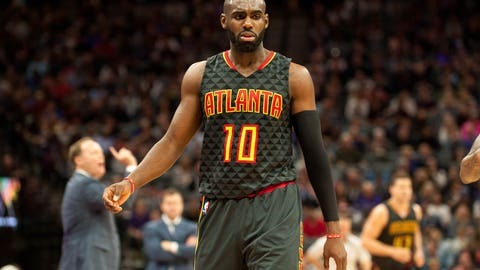 Will the Hawks be buyers? Will they be sellers? Everything appears to be up in the air. There are several different directions in which the organization could decide to go. Next: What Would A Trade With The Utah Jazz Look Like? Check back next week for episode three of the Hawks Eye View Podcast.